← Have You Noticed if You’ve Stopped Noticing? When I read a good book, I hate to have it end. However, inevitably it does. Then I’m faced with the question, What will I read next? My inclination will be to choose from two genres, literary fiction or crime/mystery. I guess I’m a victim of habit. Or routine. After I read The Book Thief by Markus Zusak, I decided to shake things up and choose some books from other genres. (I do this periodically.) I looked through the shelves and stacks of books around the house. I found three un-reads I’d purchased at workshops, seminars, and for my book club. 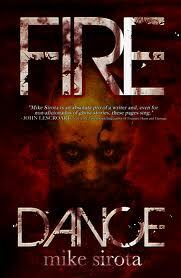 The first was Fire Dance, a novel by Mike Sirota. It’s a ghost story and opens in a fictional insane asylum of the late 1800’s located near Borrego Springs, California. It then shifts to the nearby present-day but imaginary town of Smoke Tree. There’s a definite feeling of place. The ghosts, both benign and evil, have the ability to inhabit present day people, creating plenty of foreboding and suspense for the safety of the town and the main characters Mark Alderson, Tracy Russell, and their friend, the wizened old-timer Dexter Jones. Plenty of thrills. 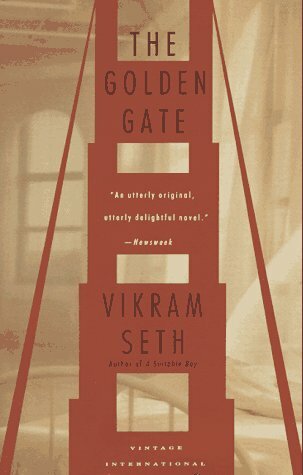 Next I read The Golden Gate by Vikram Seth, a novel set in San Francisco and entirely in verse. A modern day story, it’s written with a sense of humor and irony as the characters look for relationships. The verse is done in tetrameter (te-tram’-e-ter), a line of four metrical feet. Two verses of 14 lines each appear on a page. Once I got the feel, the reading flowed easily. 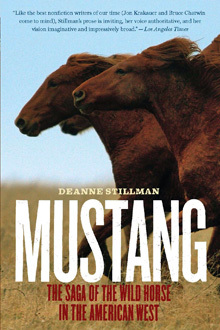 Last in my current venture was Mustang by Deanne Stillman. Place and setting inform this non-fiction book about the horse and its role in our country’s story. Painstakingly researched and documented, and written with a nobility of language suitable to the author’s feeling for her subject, it left me with admiration for and in awe of this animal. The author traces the horse from prehistoric times (such as hoof prints from the Miocene Age in Death Valley) to the conquistadors to the wide open range to the calvary to the wild west show to cowboys to Hollywood. And finally to the more present day Mustang shootings near Reno. Exploring outside your favorite genre from time to time makes for interesting reading. There’s good stuff out there to enjoy and learn from, both as a reader and as a writer. My next read is The World We Found by Thrity Umrigar. You guessed it … literary fiction. P.S. My favorite of the three was Mustang. This entry was posted in Authors, Books, Creativity, Inspiration, novel, poetry, Reading, Writing and tagged book list, books, Change, fiction, Fire Dance by Mike Sirota, humor, in a rut, irony, literature, Mustangs by Deanne Stillman, nonfiction, poetry, read, reading list, The Golden Gate by Vikram Seth, verse. Bookmark the permalink. 2 Responses to What book are you reading next? Interesting way to go about reading. Loved the restaurant verse! Funny verses throughout The Golden Gate. Laughed out loud when one of the male characters tried to ditch a gal at a cocktail party. Language in The Book Thief is beautiful.